In conclusion, there has not been a significant change in asset allocation between FY2014 and FY2015. As you can see the graph attached, the portfolio reduced equities 1% and increased alternative investments 1%. Though, it does not seem that endowments intended to rebalance the portfolio drastically due to the bad performance in FY2015. They have invested 44% in traditional assets and 52% in alternative investments, which means their portfolio even aims to earn efficient returns, considering better risk return profiles in the long run. 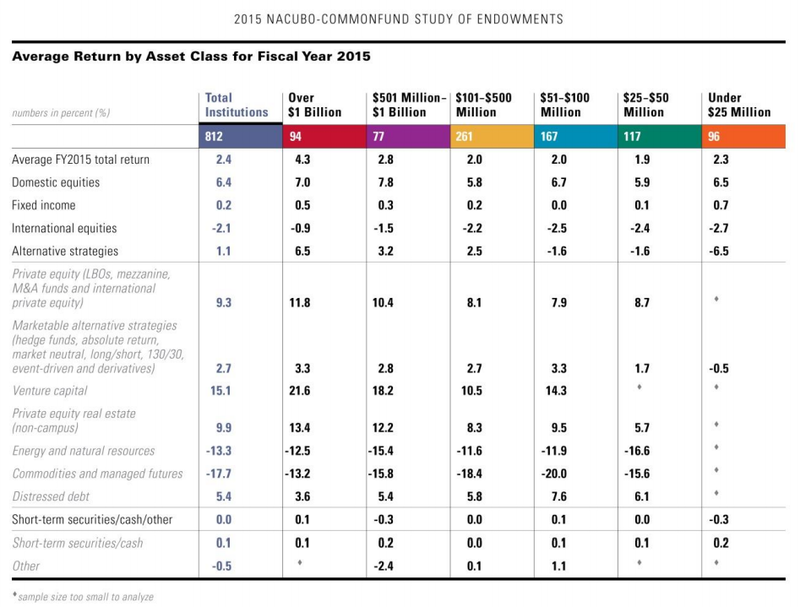 While, the endowments with more than one billion dollars in assets invest 57% of their money in alternative investments, the smaller-sized endowments with less than 25 million dollars invest in the asset only by 11% of their portfolio. I assume that this is because the larger endowments can invest more money in various alternative investments than the smaller endowments can do in a limited kinds of alternative strategies, due to the size of the investment. 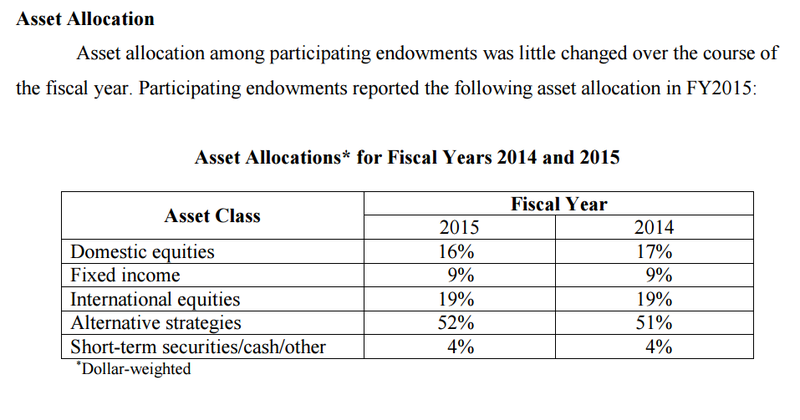 Also, while the performance of the alternative investments by the large endowments was 6.5% in FY2015, the one by smaller endowments was negative 6.5%, which made a big difference in performance. In summary, what you can learn from the performance in alternative investments in FY2015 is that venture capitals and private equities performed well and energy/natural resources and commodities dragged down the performance.